Unsurprisingly, when I started the bite-sized adventure, my instinct was to explore, explore, explore. I didn’t yet have a 60 second timer looming over me, which is the interesting mechanic the game touts as a major part of its appeal. There’s not much to do other than pick up the sword lying on the shore near your house. I knew that once I did, the timer would trigger and I’d have to abide by its rules – cycling through a minute of gameplay before my life ended, carrying over key items found to assist in unlocking more of its world for the next minute of life, and the next etc. – until I figured out how to rid myself of the curse. I did everything I could to avoid this future fate. I hung out with giant crabs on the beach. I looked around my house and idled with my cute dog. I strolled through my garden. I wanted to see what else this charming world had in store for me. But I wanted to do so on my own terms. I contemplated whether or not to accept my pending punishment. A demise of my own making for doing what video games taught me: be curious, explore everything, and be so stupidly reckless in my adventuring that I’d pick up a random sword on a beach. What should have followed, and has in many games I’ve played (The Legend of Zelda: Link’s Awakening is the obvious one that comes to mind), is that I’d embark on a grand journey of discovery, solving people’s problems, saving the world, and taking risks while cautiously trying not to die and see a “Game Over” screen. 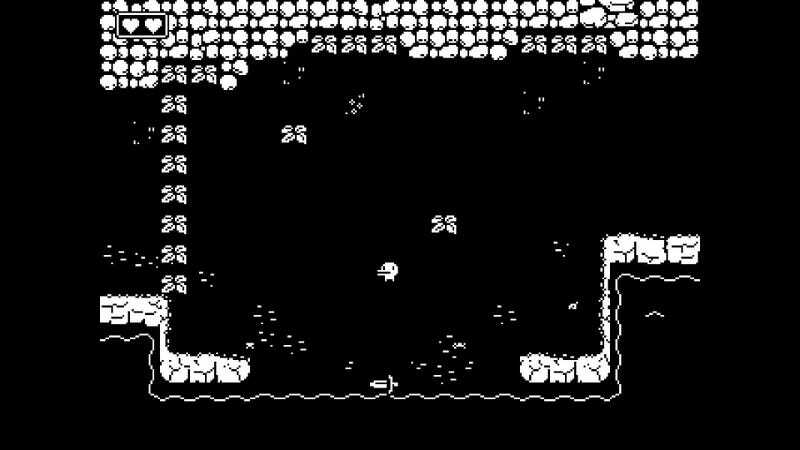 These things happen in Minit but on a focused, tightly-wound schedule that pushes against the idea of freedom and expectations I’m used to. That freedom to roam for hours on end inspecting every curiosity, padding time by collecting items I may hoard and never use, and eventually following a path to an end game, is not what Minit is about. I’m used to playing JRPGs and adventure games where this is common practice. Minit does the opposite. It’s a deliberate game that requires quick thinking. One that forces you to do what’s necessary to solve its puzzle. You get what you need. You explore with purpose and not a wandering aim. NPCs rarely engage in frivolous conversation, instead detailing exactly what you need to know. There’s no need to play too cautiously as spending time fighting enemies (unless the game requires it) wastes time. The 60 second death timer also does away with the desire to play with care. Even if pursuing its sidequests, progression through Minit takes very little time. I spent 72 minutes completing the main game, with a few requirements met for sidequests, before getting the credits to roll. I know it can be accomplished in even less. I obviously made the decision to pick up the sword. It was inevitable. But for the first minute of Minit, I debated whether or not I wanted to (or if I could) handle its creative limits – designed to make me rethink how I play video games. And for the first few minutes after that, I struggled to adapt.